There are many ways to finish a concrete countertop, all of which can make it look classy and professional. Whether you’ve bought a precast concrete countertop or you’re adventurous enough to try and pour your own, you’re probably seeing tiny imperfections and wondering how to sand concrete. Perhaps they’re not even visible to the naked eye, but running your hand over the surface reveals unnecessary roughness. Roughness that you want gone. The simplest finish to achieve is a smooth finish can be done by hand, or with an orbital polisher. With this finish, you’re not removing any of the concrete. Just polishing the top layer to be smoother and shinier. This is an intermediate finish where a small amount of the top layer is sanded off, allowing the sand underlying the top layer to be exposed, but not revealing any aggregate. This is a complete surface sanding, with a lot of material removed. Bear in mind, this finish is very difficult if not impossible to achieve without a powered polisher. If possible, you should always polish a concrete countertop. Not only does this improve the appearance of a surface, it will also go a long way in removing the tiny blemishes and flaws that come from even the most precise casting process. A variable speed concrete polisher, handheld and water fed with a variable speed setting. Diamond grinding pads, from fine to coarse. Coarser pads are better at removing blemishes and exposing aggregates, with finer grits used for the final polishes. Hand held diamond pads or sanding pads for areas that you can’t get the polisher into. How to sand concrete countertops: The method. Clean the countertop with water, then run the squeegee over it closely to remove any grit or other particulates sitting on the surface. These can cause gouges as you sand it down. Fill any flaws or holes with a patching slurry before polishing. Patching slurries are available in various colors to match or contrast against your countertop. Begin by polishing with the coarsest pad you have. Make sure you cover the entire surface, for an even and smooth finish. Keep the polisher level, and make sure it’s supplied with a constant flow of water. After polishing the whole countertop with your roughest pad, move up a step and polish it again. Repeat this process with every pad you have. Between changing pads, it’s good to wipe over the counter top again to remove dust and other bits of debris. This is done to allow you a better view of your working area and to prevent imperfections from forming. There is no hard and fast rule for how much you need to polish, or how long to use each individual grade of pad. Use your judgment and err on the side of caution. You can always go back over a countertop, but repairing a concrete counter that has been over sanded is impossible. 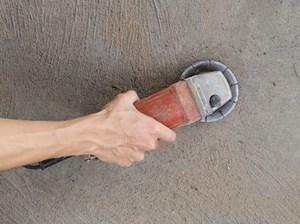 If there are any areas that cannot be reached with a grinder, it’s time to start sanding concrete by hand. Using the pads, sand over the areas where they are needed with strong, smooth strokes, working upwards through coarseness as you did with the polisher. Once the countertop is dry and has the finish you desire, let it dry, then apply a sealant to protect and seal your hard work. Can you sand concrete with regular sandpaper? Yes. You can. Unfortunately, because concrete is so tough, regular sandpaper gets worn down very quickly against it. You’re generally always better off spending a little extra for diamond sandpaper. It lasts much longer, and you’ll save yourself huge amounts of time and effort in the long run. What if my concrete is stained? If your concrete is stained, try cleaning it down before you sand and hope the stain comes out. Removing grease is especially important because grease can affect pigmentation and stop the staining color from penetrating fully into the concrete. The best way to clean a concrete surface is with a mixture of 1 cup of trisodium phosphate or 2 tablespoons of degreasing dish fluid with 4 gallons of water. Mix well and scrub the entire surface down with a stiff brush. Once clean, rinse the surface down, then mop up and leave to dry or use a wet vacuum to remove the remaining water. Interior concrete floors can be sanded, but be aware that when you sand an interior concrete floor, you will have to use the same process over the entire surface of the floor, whether it needs it or not. The reason for this is because sanding affects the surface of concrete and how far colors and staining can penetrate into it. So if you sand one section of a concrete floor, then stain the whole floor, the area that has been sanded down will be a noticeably different shade. Hopefully, now you understand how to sand concrete and know everything you need to achieve the perfect look in your home. With a little bit of care and attention, you’ll be able to get the exact finish that can set up any room. The part is that you can do it all yourself. If you’ve got any questions, or maybe any tips for our readers, feel free to leave them in the comments below.